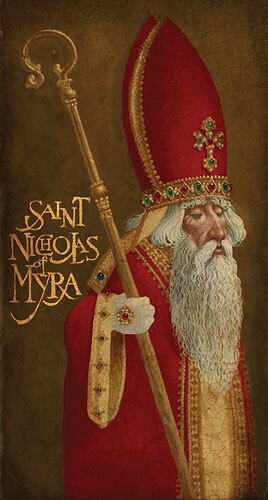 Nicholas flourished in the 4th century as Bishop of Myra in Asia Minor and is universally recognized as the model for our modern day Santa Claus. He is a figure about which there are more legends than facts. Patron saint of sailors, one legend tells of him appearing to storm-tossed mariners who invoked his aid and were brought safely to port. In the Low Countries of Europe, stories of his generosity were legendary and gave rise to the custom of exchanging gifts in his name.